The Fiesta Park Subdivision is in the South Area of Tucson, AZ. Shopping, restaurants, and activities can be a bit of a drive depending on the specific subdivision you live in. Homes in the Town of Vail on the west side of I-10 are in the South area. 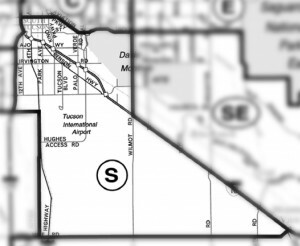 The South area starts just south of Tucson and on the west side of I-10 and continues to I-19. Fiesta Park Subdivision is minutes north of Green Valley, AZ. Families living in Fiesta Park Subdivision are served by the Sunnyside School District. Restaurants to visit if you live in the Fiesta Park Subdivision or another South area location would be The Vail Steakhouse and Hacienda Del Lago. Are you thinking of buying a home in Fiesta Park Subdivision or another area of Tucson? Finding the right home can be a challenging process. But we can make the process much less stressful for you.